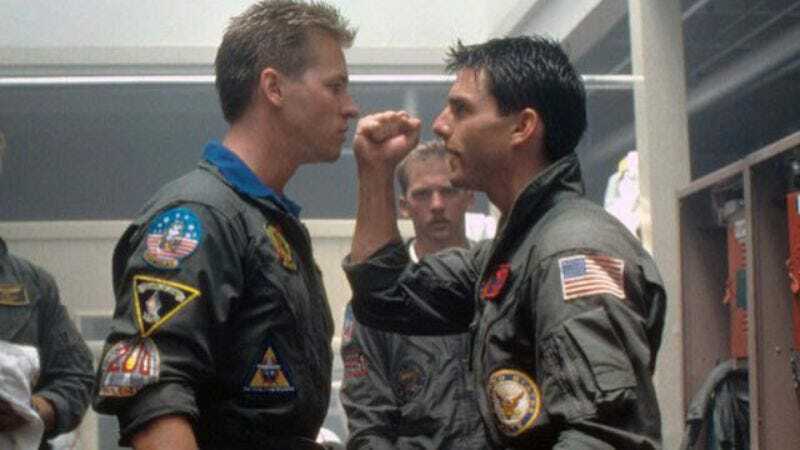 At the time of its release, Top Gun was praised for being an MTV-ready film that was able to use the assistance of the US Air Force to bring some measure of realism to the various flyboy scenarios. As time has gone by, the film has garnered a few revisionist views (like how people think it’s just a romantic tale between Maverick and Iceman), and it’s become the source for the danger zone Archer meme. And now comes news that it may not hold up to its myriad attempts at military realism. Over on We Are The Mighty, a site devoted to lifestyle and entertainment issues written by and for the military community, Wade Carroll goes through 79 different instances in which the film fails in its attempt at realism. Most of these are smaller items that would be lost on civilians, like the fact that CATCC operators shouldn’t be sweating in the opening as the location is usually kept freezing cold. But there are some more glaring mistakes like mystery fuel gauges in the co-pilot’s space, defiance of physics and plane mechanics, or that a lot of cool visual effects would make zero sense in context of a dogfight. There’s no mention of the well-known volleyball game, so it would appear that the vaguely sexual athletic display follows appropriate military protocol.